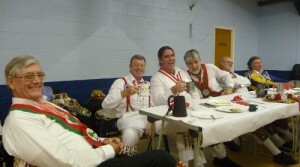 Way back in late March I was generously invited to go to the sleepy town of Bracknell, just outside Reading, by the Kennet Morris Men to be a distinguished guest at their annual “Ale & Feast”. For those who aren’t in-the-know, the term “Ale” is not singularly about beer in this context, but is instead the name given to a gathering of morris dancing sides. The term, I’m told, originates from social & fundraising gatherings which would be held by parishes and known as Church Ales: however in a piece of cyclical etymology, they were so-named because of the beer which would be sold there to raise money for the church. 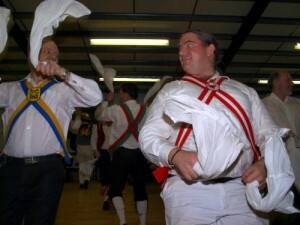 This evening in Bracknell there was no money, no church, but there was indeed morris dancing and beer. The host side were the men of Kennet – who I’ve had good fortune to meet several times, notably at Saddleworth Rushcart – and we were also joined by varying numbers of dancers from the sides of Yateley, Victory, Long Man, Greensleeves, Hartley, Ickneild Way, and St Albans – as well as by Squire of the Ring (and member of Hartley), Brian Tasker. An Ale in the UK is primarily dancing for its own sake, and in this case we were in a Scout Hall – so it was very much just for the enjoyment rather than as a public performance. A truly steep amount of dancing took place, with each side taking turns performing a dance for the others to enjoy, or if a dance was suggested that more people knew there was the option of forming a scratch team, or a massed dance. Some of the dances were a bit on the silly side, and not knowing how one went was no reason not to join in – in many ways it’s an ideal opportunity to learn a new dance that your side doesn’t normally tackle, for example Victory don’t routinely dance anything from the Bucknell tradition, but were ready to jump in & get involved in Queen’s Delight! The middle of the evening was the Feast: as is now a Kennet tradition, we were served an excellent selection of chilli (which they’ve perfected to an artform to the extent that there’s a master spreadsheet which they use to work out quantities for their Mild, Medium and Hot varieties), all washed down with generous gulpings of excellent beer courtesy of the Loddon brewery. And then on with more dancing, until well after midnight we decided to call it a night – collapsing exhausted in a spare corner of the hall. As a guest of honour I was invited to sit at the head table at the Feast, which was a bit of a buzz! I’d like to offer a massive thanks to the lads from Kennet for their hospitality and good company, and I look very much forward to seeing them again soon. And I believe I spoke on behalf of Adelaide Morris Men that evening in thanking them for an excellent evening, and promising to invite them to one of our events in reciprocity. 1) Whilst Saturday night was a rare gem among evenings, Sunday was less so for this little black duck, and the afternoon involved an attempt at going to the IMAX in Wimbledon to see blockbuster epic Avatar. I wonder if I’m the only person to ever fall asleep during that 3 times?